Think Bont and you’ll probably imagine the world’s best cycling shoes on the feet of some of the highest profile riders of the pro-peloton. But the Australian-based global cycling shoe company also produces an entry-level cycling shoe that boasts many features of their top shelf offering, at under half the price. 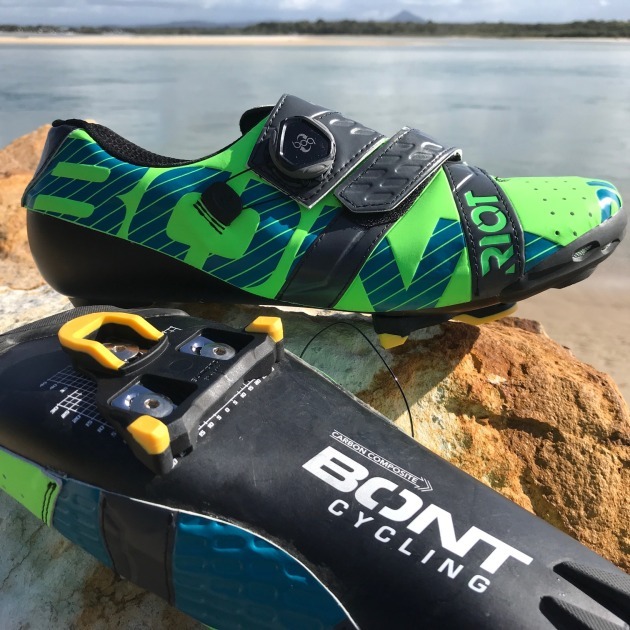 Bicycling Australia have been road-testing the ‘Bont Riot Plus’ on the coastal and hinterland roads that will be used in the inaugural Noosa Classic on August 26 – here are their findings. Pricing generally comes at the end of a review but with a retail tag of around $230, that’s certainly one of the headline features of the updated Riot Plus. Offering many of the attributes of its big brothers the Vaypor and last year’s major release the Helix, the updated Riot Plus sure packs a punch, particularly considering its price point. With a single BOA dial in place of the original Riot’s micro-adjust buckle, the Riot Plus not only deliver the pro-level feel of their more superior siblings – the Vaypor & Helix – but offer a quicker and more efficient closure and tensioning system over the superseded model. Following factory advice the new shoes were put into a pre-warmed oven of 70 degrees celsius – this was done before fitting the cleats and after sliding out the insole. After 20 minutes in the oven, and after a few minutes of cooling, I fitted the shoes, tightened the velcro then BOA and allowed to shoes to cool to room temperature. The result – fully customised fitting in a $230 cycling shoe! Bont Cycling’s entry level Riot Plus offer many of the features of their top-shelf siblings, the Vaypor Plus and Helix. With the shoes fitted – and the added luxury of brand new compression socks from 2XU just for the occasion, it was onto the bike and out for an undulating 40km reccy ride around the Noosa Classic course on Queensland’s Sunshine Coast. Bont are well known for their research, development and reputation so far as power transfer goes – that is taken as read. One of the first things I noticed about these shoes, particularly as the bitumen curved upward, was the feeling of increased efficiency not just when pushing down on the pedals but noticeably when lifting them as well. Leaning down and giving each BOA dial a tweak just before the climb, the shoes actually felt as comfortable, sturdy, solid and secure as their big brothers – the premium level Helix. 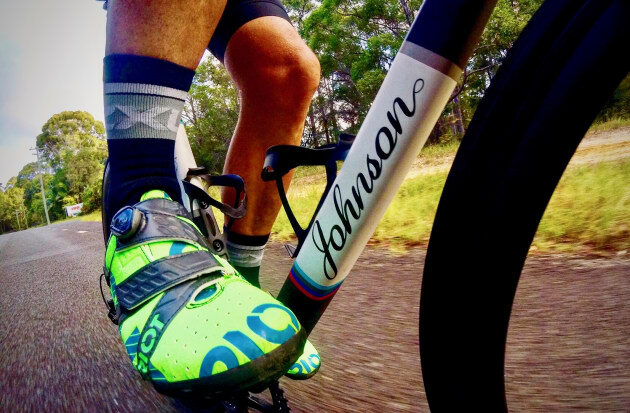 The Bont Riot Plus shoes in action during a Noosa Classic course ride. The Riot Plus are not quite on the same level as the Vaypor or particularly the Helix – lacking the leather upper, full carbon sole, revolutionary full foot/single BOA closure system etc, but the Riot’s certainly punch several divisions above their weight. Turn the shoes over and you’ll see Bont’s intricate cleat alignment markings, a smooth, flush and aero efficient base, and sturdy removable / replaceable heel pads. These, complete with new mounting screws, are available from Bont and dealers as required. In summary you’ll be getting serious bang for your buck with the Bont Riot Plus. Purchase wise they’re a no brainer – perfect for the more advanced rider who might ride Fondo’s or race in Vaypor or Helix shoes but looking for a high-performance training shoe. Similarly these would well suit an intermediate rider looking to step into a premium feeling shoe priced at just a few dollars more than the entry-level competition.